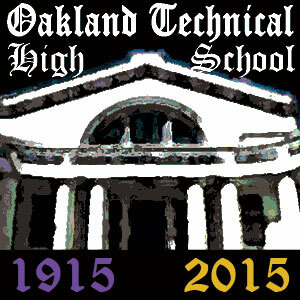 2014-15 marks the centennial year of Oakland Technical High School. Tech has been at its current location since 1914. The magnificent building, which attained official landmark status in 1985, was designed by J. J. Donovan who believed a school‘s façade should reflect the lofty work going on within its walls and who was a proponent of the use of natural light and native plants. Tech’s founding principal, P. M. Fisher, was also way ahead of his time believing in the value of both vocational and academic instruction and in fostering strong school spirit and a bond with the larger community. The school opened on January 4, 1915 with 76 teachers and 1,450 students. The main building, which looked from the outside much as it does today, contained a commercial wing (for bookkeeping and stenography), an academic study wing, a home economics area, and drafting rooms for mechanical, architectural, and free-hand drawing. Separate buildings housed eight shops: machine, forge, foundry, electrical, carpentry, plumbing, and metal working. Over the years, Tech grew to its present size of slightly over 2,000 students and its programs expanded or shrank depending on the affluence of the city and state and their prioritizing of public education. Although the school was substantially rebuilt between 1977 and 1983, hard times hit in the 1980s and many academic and extracurricular offerings were cut. Fortunately, the combined efforts of the PTSA, dedicated teachers and staff, and a spirited student body have built Tech into the strong school that it is today with solid academics, a half dozen academies, and a variety of sports, arts, and club offerings. The overwhelming majority of its graduates go on to college. Oakland Technical High School has produced some of the greatest athletes, academics, artists, entertainers, scientists, social activists, statesmen, and scholars of any high school in the country. Click here to view a brief list of notable Oakland Tech alumni. This year, current students and staff, alumni, and parents have joined forces to offer a series of events celebrating the school’s 100th anniversary. More information is available on the school’s website including how to purchase the recently published 200-page centennial book containing alumni memories and biographies, photos from every decade of the school’s life, and interesting material from student publications over the years. 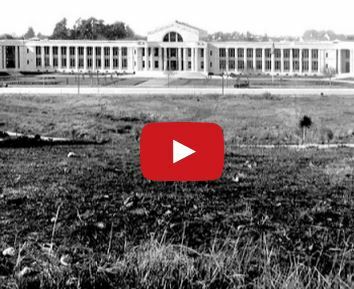 You can now view the full-length version of the historical video, narrated by Ted Lange '66, which was shown at the History of Oakland Tech Centennial event on May 22nd, 2015.